"Using PDF to Improve Business"
Improving business practices using PDFs has become popular amongst companies for their benefits in aiding business operations in a trusting manner. It is an essential file format for improve business practices because it allows users to securely transfer and view electronic documents. The Portable Document Format has been the industry-standard for decades, namely because of its complacency in file sharing across a wide range of operating platforms and devices. What are the benefits PDFs can aid in business operations? How to use PDFs to improve business practices and take your business to a top notch level? It’s layout consistency amongst any device, regardless of the type of device. It gives businesses limitless opportunities for information retrieval. PDF’s gives the ability to compress large files makes it that much easier to download, open, and save files for clients using various devices. Its dependable format lets businesses to confidently share their important files with their respective clients without having to worry about any data breaches. 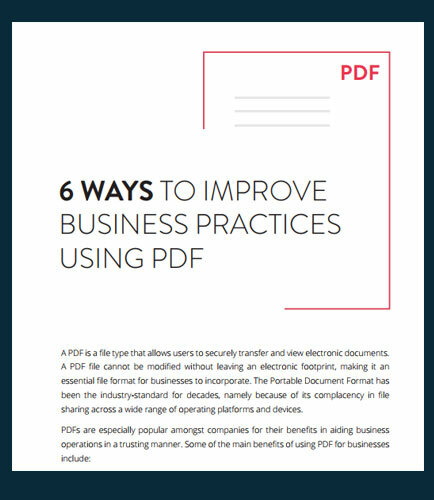 This whitepaper offers some of the key ways in which organizations can improve business practices using PDFs. And, it is clear that PDF is the most viable option for business purposes and it will boost productivity, encourage collaboration, and ensure security.